For many of our FNS Challenge participants, the most difficult and enlightening aspect of the Challenge and biggest change from their normal lives is the trip to the grocery store. The process takes time, organization, forethought, and quick fingers on the calculator. Check out the links below to read about some experiences preparing for this week’s Challenge. Hear from a veteran participant who has learned a few tips since the last time he took the Challenge. Read about her detailed planning process and menu for the week with a strong emphasis on nutrition and fresh ingredients from her local farmer’s market. Gideon’s whole family is participating in the Challenge this week. Check out the detailed meal plan his wife constructed to help them stay organized and under budget. 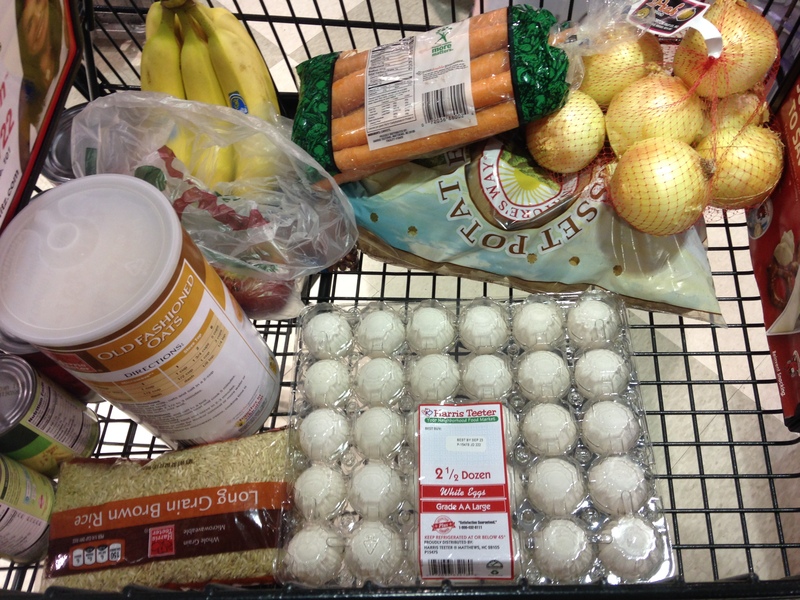 Read about Molly’s intense visit to her local grocery store and her strategy behind her shopping choices. I think going grocery shopping was the hardest part. I made a trip to the store just to price things and then went home and made myself a spreadsheet so I could stay within the budget. It was pretty difficult to get everything I needed for only $20.30. I’m eating almost all store brand products because they were the cheapest option. I was a little concerned about the quality of these products, but everything has been pretty good so far. (Except for the instant oatmeal I got, it’s a little mystery tasting.) Also, I used the produce scale for the first time ever. I usually just throw some tomatoes in a bag and go on my way, but with this challenge I knew I could only afford a $0.50 tomato, not a $0.75 tomato. Now that I’ve bought my food, I’ve been following my meal plan. It’s definitely smaller portions, but I’m staying full. Over 30 Food Bank staff and community members are taking the FNS Challenge this week to get a sense of what life is like for thousands of people in North Carolina that receive FNS benefits and live on just $4.06 worth of food each day. To learn more or to take the Challenge yourself, please visit our website. Also be sure to follow the meals and experiences of Challenge participants on Twitter using #406ADay.